Jami holds a NSCAA Advanced National Diploma, is co-founder/president of Global Soccer Metrix, and a former Assistant Director of the National Soccer Hall of Fame. She was an All-American goalkeeper at William Smith College, NYSWYSA ODP Coach, and formerly head coach of the Hartwick College women's team. Follow her on Twitter at @JDansingburg. 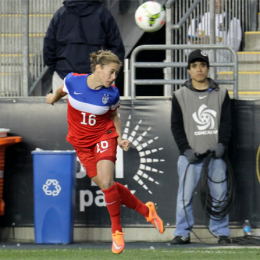 Jami Dansingburg breaks down the US Round of 16 win over Colombia at the Women’s World Cup. Jami Dansingburg analyzes the US win over Nigeria to conclude group play at the Women’s World Cup. New PSP contributor Jami Dansingberg analyzes the USWNT’s scoreless draw against Sweden and looks ahead to Tuesday’s final group game against Nigeria.